These Mini Lump Crab Cakes served with Shaved Fennel, Cara Cara Orange and Citrus Emulsion are delicious enough to be served on their own! If you can not find Cara Cara Oranges, any other type of orange will do. In a medium mixing bowl, add mustard, honey and shallot. Slowly whisk in orange and lemon juice + zest with a fork. With an immersion blender, or a regular blender, blend mixture. While blendning, slowly add in olive oil until completely incorporated. Season dressing with salt to taste. 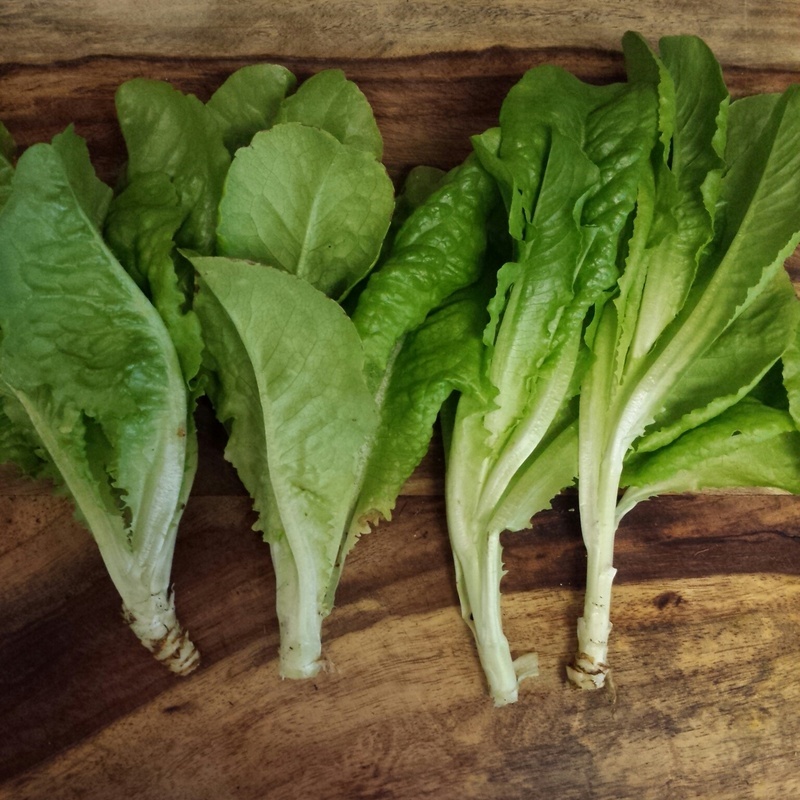 If vinaigrette is too agressive for you, blend in 1 tablespoon of cold water. Chill sauce in refrigerator until ready to serve. 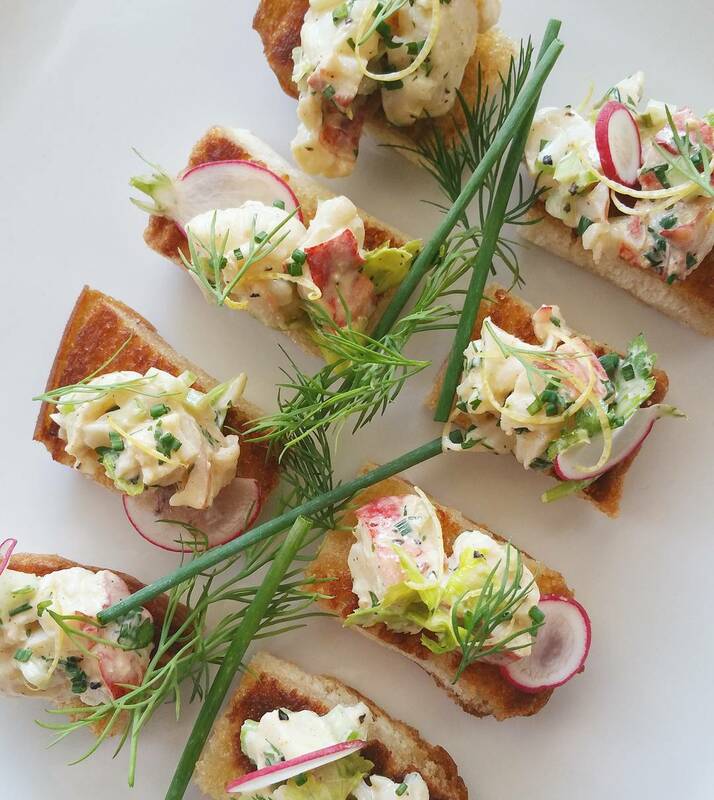 In a separate medium mixing bowl mix together crab, shallot, lemon zest, dill, chive, mayonaise and mustard. Sprinkle with salt and pepper. With a rubber spatula, gently fold ingredients together to keep crab from falling apart too much. Once incorporated, take 1 tablespoon of crab mixture and shape into a patty.. a crabby patty if you will. They should be about 1 inch in diameter. Then, dip each side of the crab cake into panko bread crumbs. Do not coat completely, just on the top and bottom to give it a nice crunch. Do this until all crab mixture is used. Want to make one big crab cake? Heck yeah, you do that! Just take a few more tablespoons of crab meat and repeat process. Pre-heat oven to 400. In a medium saute pan heat olive oil over medium high heat for 1 minute. Gently add crab cakes and pan fry until golden brown. Flip, and repeat on toher side. Once both sides are browned place all crab cakes onto a baking sheet. Heat in oven for 6 minutes until 165 degrees. 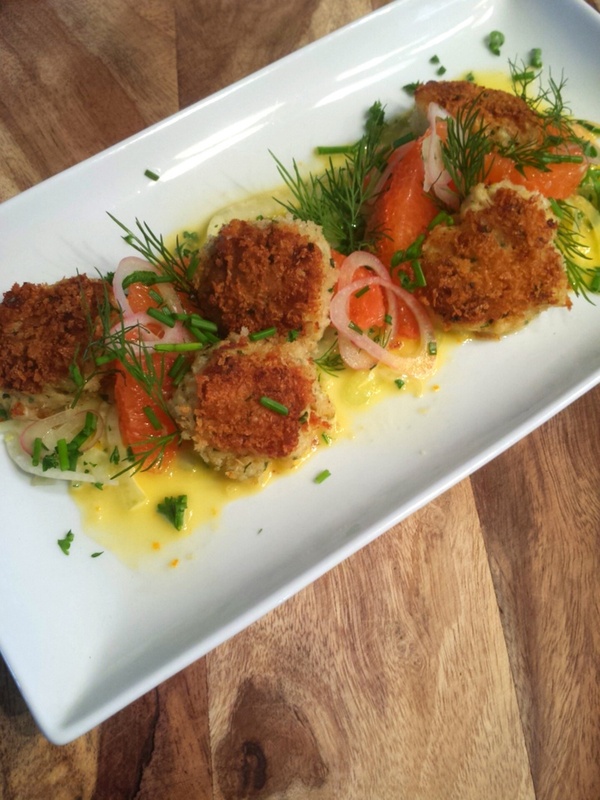 Serve crab cakes over shaved fennel, cara cara orange supremes and fresh herbs. Drizzle the citrus emulsion around the plate to not soak the crabcakes. 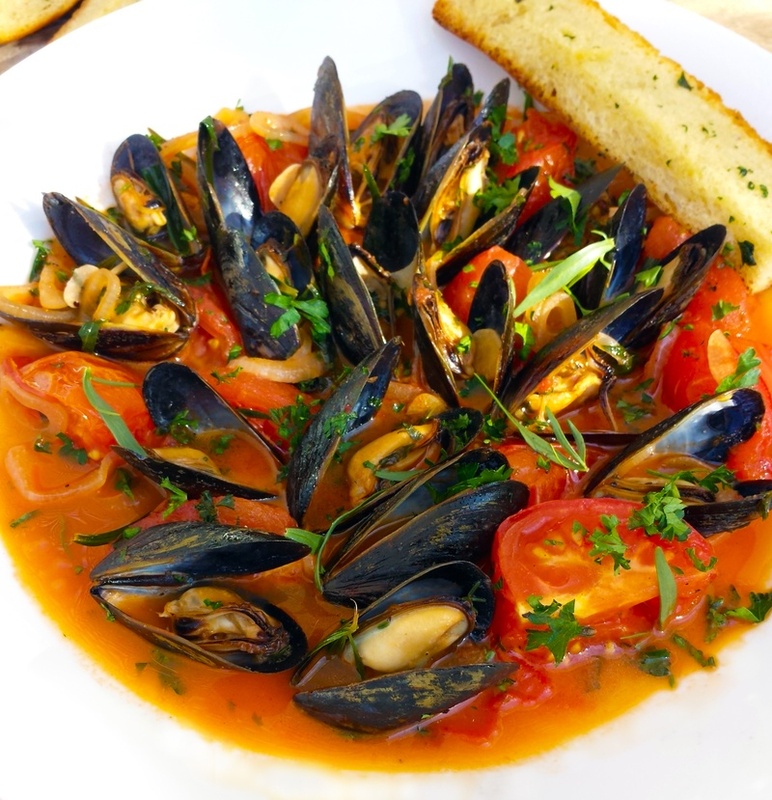 This Mussel Dish with White Wine, Tarragon and Tomato Broth can be made in almost no time at all and would be great as an appetizer or entree. 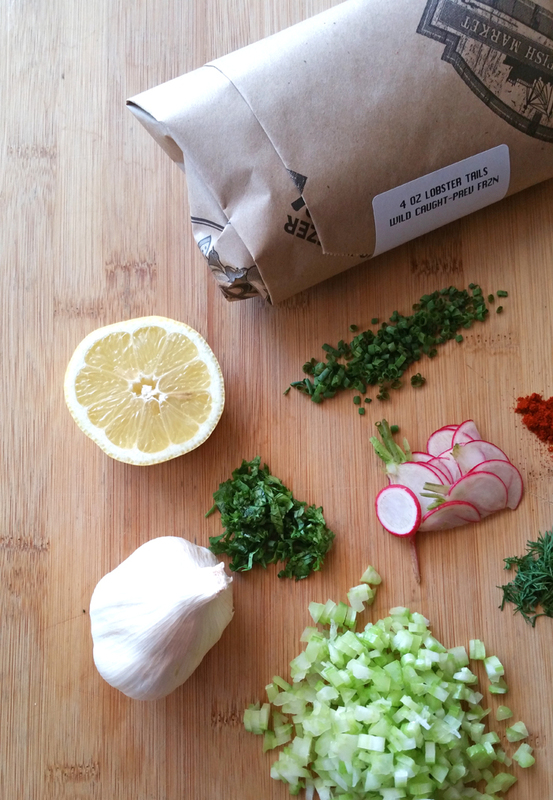 Be sure to serve this with some crunchy garlic bread to soak up the flavors of the broth. Pre-heat oven to 375. Cover a medium sheet tray with aluminum foil and drizzle 1 tablespoon of olive oil over it. Place quartered tomatoes sliced side down onto the tray and bake in the oven on the medium rack for 35 minutes until tender. Remove tomatoes from oven and allow to cool for 5 minutes. In a medium saute pan, heat 1 tablespoon olive oil over medum high heat. Add shallots and garlic to pan and saute for 1 minute. Add roasted tomatoes to pan and saute for 1 minute. Add white wine, tomato paste, chile flake and mussels to pan and stir with a wooden spoon. Season with salt and pepper to taste. Put flame up to high heat and place lid over pan. Allow mussels to "steam" for 2 minutes until all of them have opened. If there are any mussels that have not opened after 3 minutes, discard them as they are unedible. Remove lid, add tarragon, parsley an cold butter to pan and simmer for 45 seconds. Place contents of pan into a large bowl. Serve with small forks, a bowl for shells and some really tasty bread! 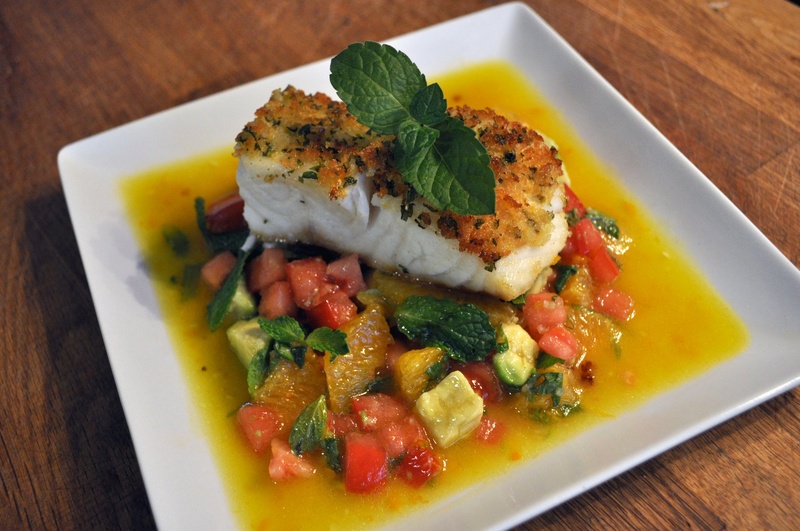 This bright and refreshing dish can be made with almost any type of firm white fish! Halibut would also be exceptional. For Salsa: Add tomato, orange, avocado and mint into a medium mixing bowl until incorporated. Season mixture with salt and pepper to taste. In a medium bowl, whisk cider vinegar, honey and Dijon together. Slowly whisk in orange juice and zest. Once orange juice is incorporated, slowly whisk in extra virgin olive oil and season with salt and pepper. Pre-heat oven to 375. Pat fish filets dry with a paper towel to remove any moisture. Season both filets with salt and pepper. Mix panko bread crumbs with chopped mint. Spread 1 teaspoon Dijon mustard onto each filet, then dip each filet Dijon side down, into panko mixture. Heat medium sauté pan over high heat and add olive oil to pan. Once pan is very hot slowly add filet into pan. Cook for one minute on crusted side until golden brown. Then flip fish and cook the other side for about 2 minutes. Move fish onto an oven safe pan and cook in oven for 7-10 minutes until cooked thoroughly. This dish looks hard to make, but it's really quite simple. Cook the bacon, puree the cauliflower and make the pesto ahead of time so you have the time to focus on perfectly cooking those scallops. Also, you don't always have to use pinenuts in a pesto, almonds or walnuts will work just as well! Cook bacon in a medium skillet over medium high heat until crispy. Dry on paper towel then chop into bacon bits. Put to bacon side. In a medium saucepot add cauliflower florets. Cover with warm water until halfway. Place lid on pot and cook over medium-high heat for 10 minutes or until cauliflower is tender. Drain cauliflower and return to pot with no heat. Add cream and a pinch of salt and pepper to taste. Blend ingredients with an immersion blender until smooth. Add 1 or 2 tablespoons of water if needed. Hold puree in pot and keep warm until ready to serve. In a blender or with your immersion blender, blend nuts, basil, tarragon, parmesan cheese and 1/2 cup olive oil until incorporated. I like my pesto a little chunkier, but you can blend yours until your desired consistency. Season pesto with salt and pepper to taste. If pesto is a little bitter, add more cheese or a small amount of honey.Put to side until ready to serve. Remove scallops from the fridge and pat dry with paper towels. The drier they are, the crispier they will be. Remove additional abductor muscle on scallop if present. Season scallops well with salt and pepper. Heat a large saute pan over high heat and add 2 tablespoons olive oil. Once you start to see little whisps of smoke rise from the pan, it is time to sear the scallops. Make sure oil is spread evenly over pan surface, and gently add scallops to pan. Allow scallops to cook over high heat for 2 minutes. With a fish spatula or a pair of tongs, gently lift scallops off of pan and flip. Cook for another two minutes on the other side. Scallops are done when opaque and firm. Plate cauliflower sauce first, then add scallops, top with bacon crumble and drizzle pesto oil around plate. Enjoy! 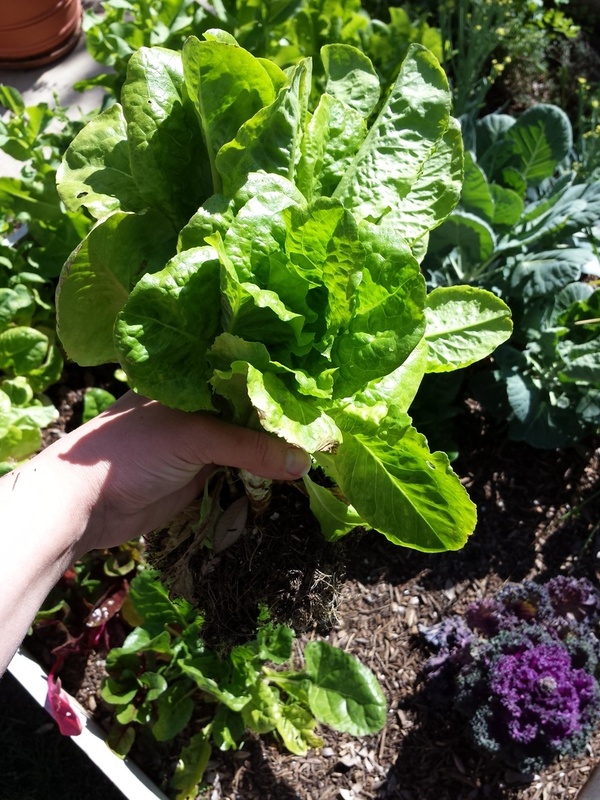 Shallot greens are a lot like a green onion or scallion, except they are much bigger in size and flavor! Be sure to slice them thin because they are very strong in taste. Skewer shrimp and and store in refrigerator for later use. Start grill. Heat whole Poblano pepper over open flame or under broiler until black and charred. Always use caution when working with an open flame. Put roasted pepper into a plastic bag or a bowl with a lid to “sweat” until soft. Once pepper is soft, remove charred skin by wearing a glove. Remove stem and seeds from pepper with a knife, chop pepper into chunks and place into blender. Add avocado, water and lime juice to blender. Blend until smooth. Add salt and pepper to taste. Hold puree in refrigerator until you are ready to assemble your tostada. Season shrimp skewers with salt and pepper. 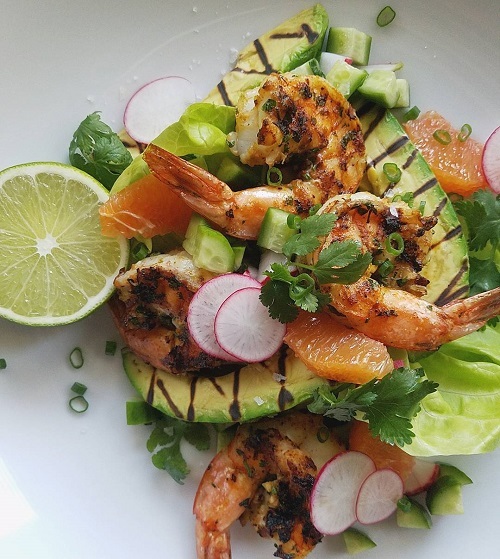 Grill skewers over open flame, or on cast-iron pan, until shrimp are opaque and pink. 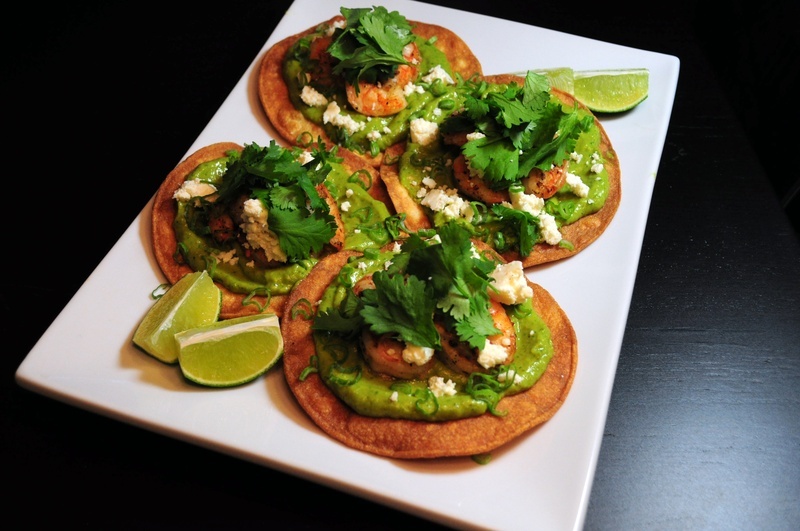 Now that your shrimp are cooked, it is time to assemble your tostadas. Add a spoonful of avocado pepper puree over each tostada and spread throughout. 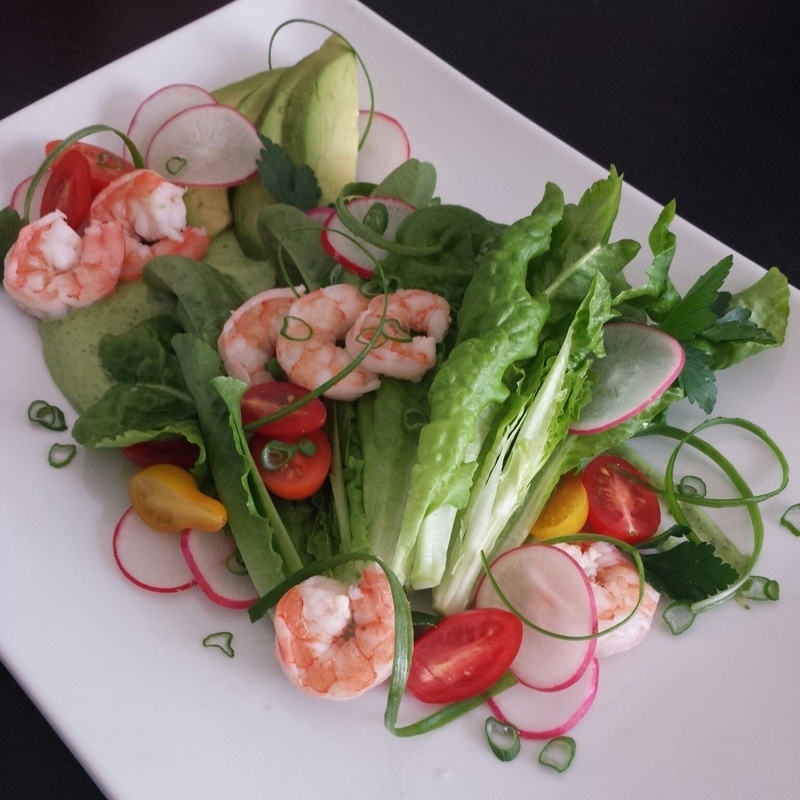 Top each tostada with four shrimp, crumbled queso fresca, chopped shallot greens and fresh cilantro. Eat by hand or with a knife a fork! In my personal opinion, the best part about eating a fresh salmon filet is the deliciously crispy skin. Here I will show to step by step how to sear and cook a salmon filet so you get that extra crispy skin that everyone loves. 1. Pre-heat your oven to 400 degrees. Do inspect the skin side to make sure there are no extra scales. If there are, simply taking an upside down butter knife and runnning it back and forth along the skin should jostle any loose. Rinse your fish and dry well with paper towels. This is crucial to getting an extra crispy crunchy skin. 2. I began by trimming my salmon filet down to size. Your local seafod market should have portioned filets available for you, if not you can simply ask them to cut one for you. a 4-6 oz. filet in generally good for one person. This is a beautiful piece of =Scottish Salmon that I purchased from Santa Monica Seafood. Take your filet and season both sides with salt and pepper. 3. Heat your saute pan over high heat. Allow your pan to heat up for about one minute. This is essential to getting both color, and a crispy skin on your salmon. Pour your oil into the pan. Grapeseed oil has a higher smoke point than other other oils like olive or vegetable. A smoke point is at what temperature the oil in a hot pan will begin to smoke. 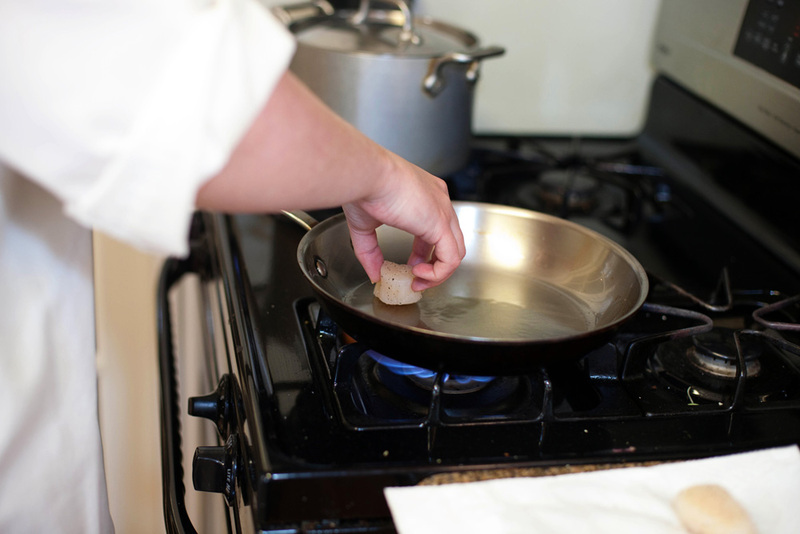 Since grapeseed oil has a higher smoke point, the pan can get hotter without any smoke. 4. 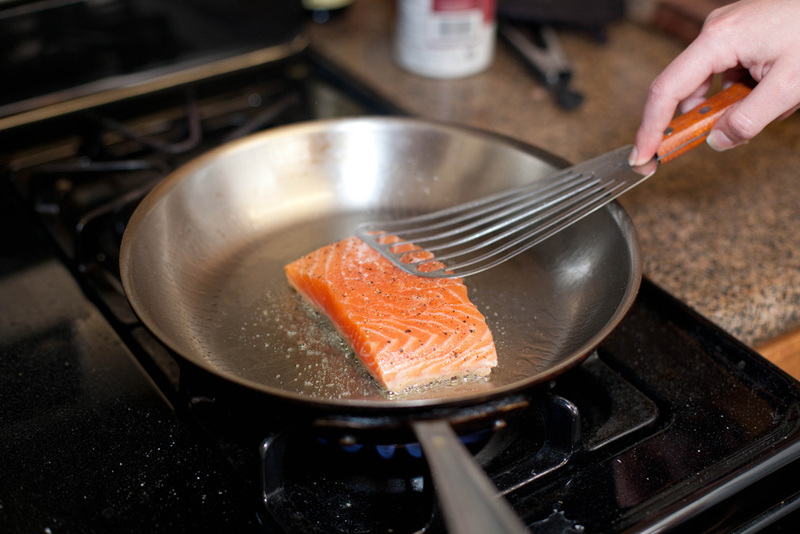 Slowly put your salmon into a hot pan *away* from you. 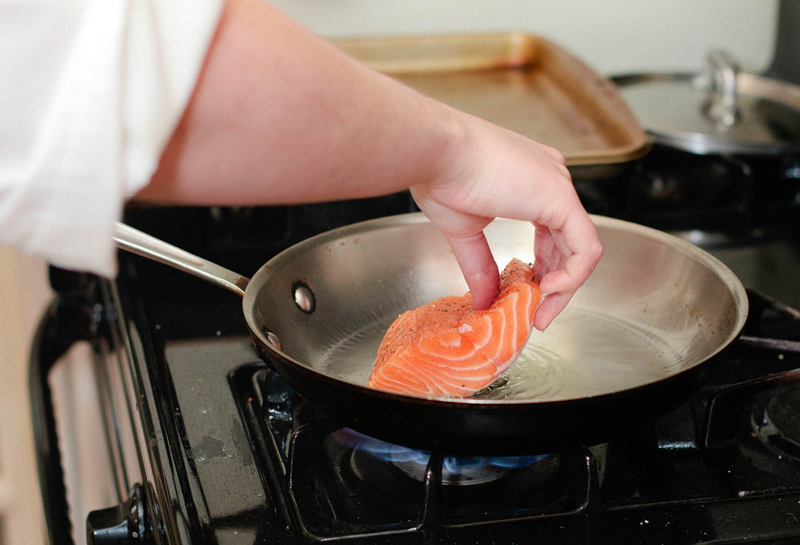 This is a safety precaution, as if the salmon slips out of your hands, it will splatter the hot oil *away* from you and not towards you. 5. Quickly grab your spatula and with gentle pressure push down on the fish. This is done to prevent the skin from curling up from the high heat of the pan. 6. Reduce your heat to medium-high and allow the fish to cook for 2-3 minutes. Do not try to move the fish during this time. Once the skin is crispy enough you will be able to slide your fish spatula under the filet. 7. Remove the filet from the pan, onto the sheet tray and into the oven to finish. 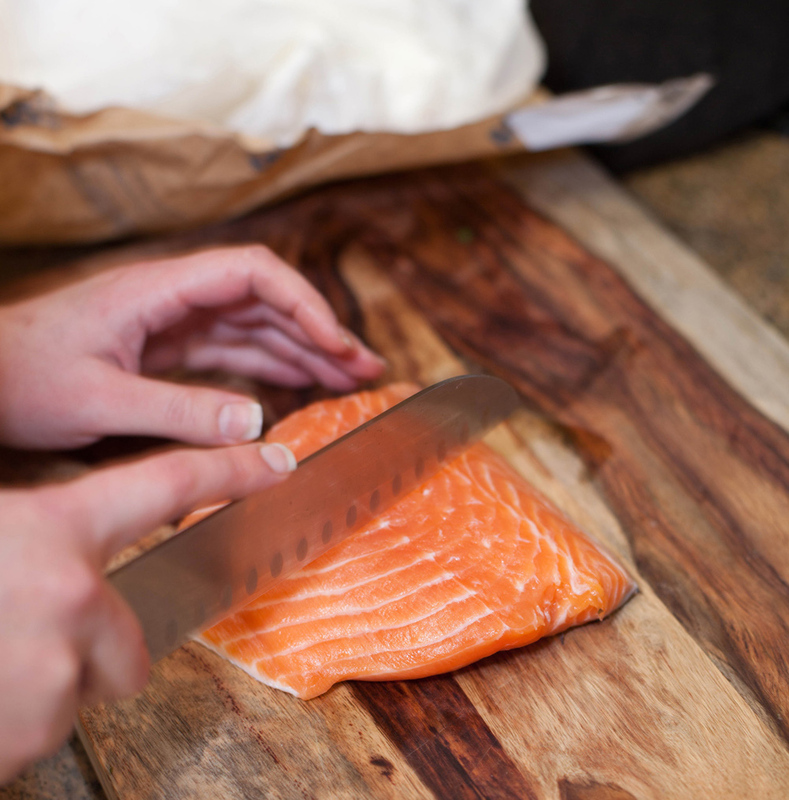 Your salmon filet should take about 4-6 minutes to cook depending on how well you prefer your salmon done. If you like it medium or medium-well, err on the side of 4-5 minutes. If you like your salmon well done it should take about 6-7 minutes. 8. 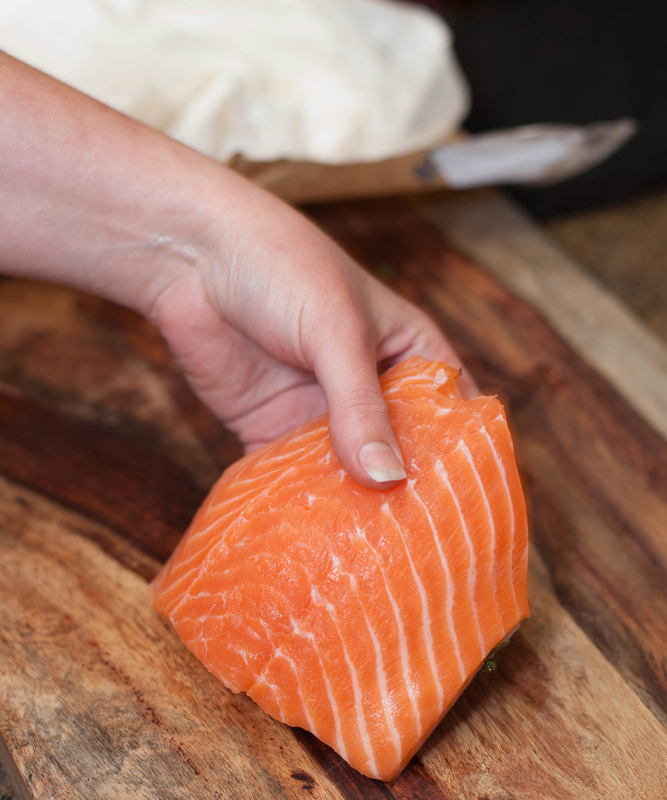 Remove your salmon from the oven and allow to rest for 2-3 minutes as the fish will continue to cook. Plate your fish skin side up and enjoy! 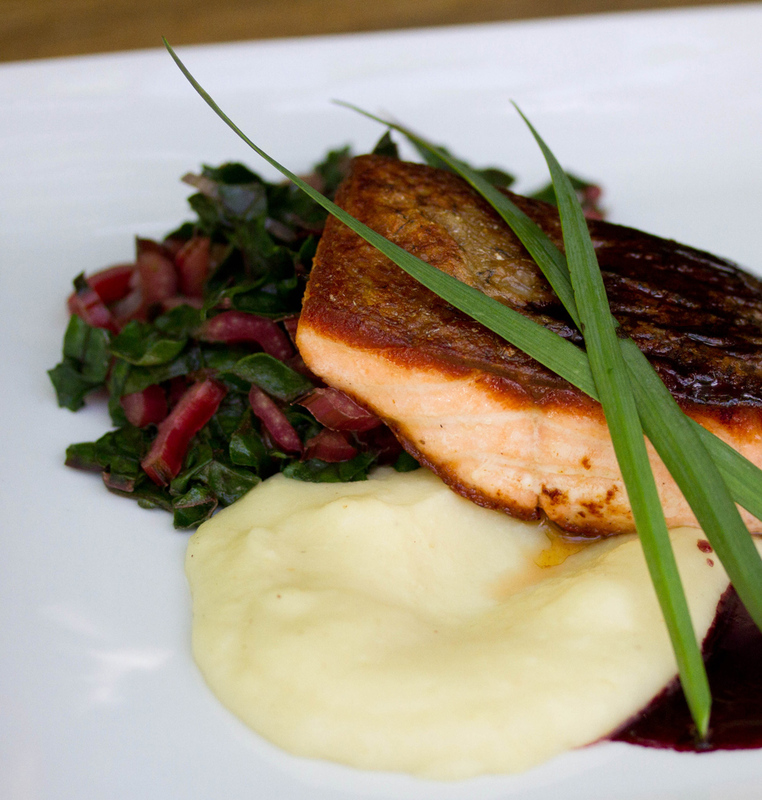 I served mine over a parsnip puree, sauteed swiss chard and a port wine reduction. This past weekend I had the joy of being photographed by my close friend Stephanie Gill http://stephaniegillphotography.com. We spent the morning at the farmer's market, then the rest of the afternoon cooking and taking photos with the fresh ingredients I purchased. Here through her photos I will instruct you step by step how to sear and cook some deliciously sweet sea scallops. 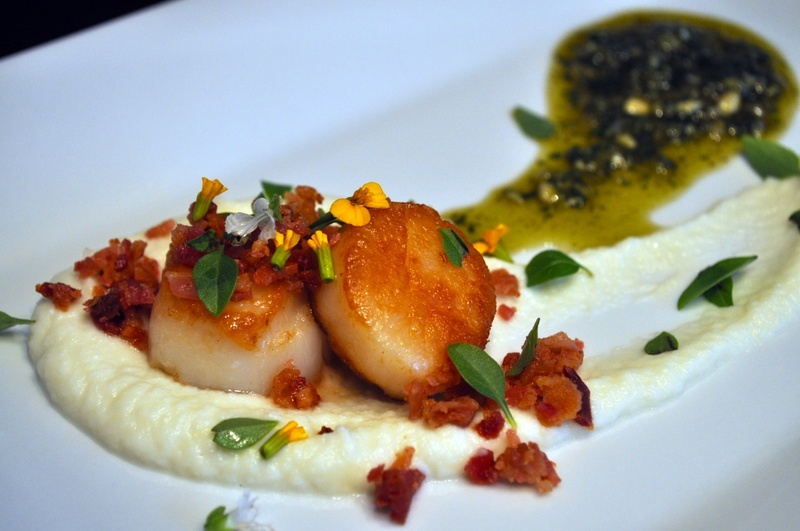 Scallops are an elegant and sophisticated ingredient that are super simple to prepare! Most scallops for sale have a small membrane remaining on them from when they detached from their shell. Simply feel around the edge of each scallop until you find it, and remove it. This part is edible, but not supposed to be eaten. 1. Season all of your scallops with salt and pepper and dry with a paper towel. 2. Heat your skillet over medium high heat and add 1-2 tablespoons of oil. 3. Wait until your pan is barely smoking hot to scallops into pan. If scallops are placed into the pan to early, they may stick and fall apart. Just make sure your pan is nice and hot. 4. Place each scallop into pan. Reduce your heat to medium to let your scallops caramelize and cover with a lid for 2 minutes. 5. Remove lid and flip scallops over with tongs. Cover again and cook for 2 minutes. 6. When scallops are fully cooked they will be opaque and firm to the touch! They go great over a risotto, polenta, purees and salads. 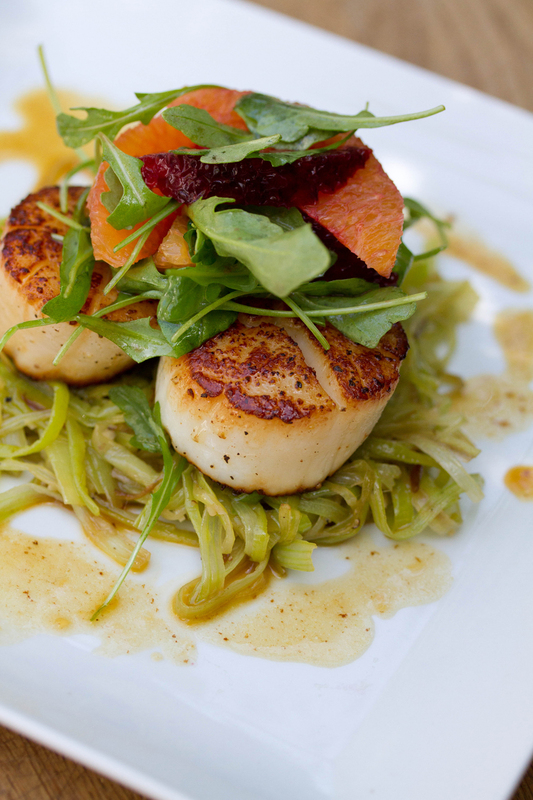 I placed my scallops over a bed of braised leeks, and topped it with a blood and pink orange salad with a orange pan reduction sauce. Yum! !